Book Sailing – make sailing easy! Book Sailing was started in 2011. The background for this business comes from sailmaking, rigging and tuning of sailboats and a lot of experience with sailing and learning others in this skill. 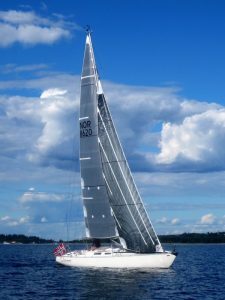 Karl Otto Book Has been working as a sailmaker since 1999 and has sailed all kind of boats, from dinghies to large keelboats. Book Sailing which consists of Karl Otto and Maren, are now on a long distance cruise and this has given a lot of new and useful knowledge that you may get a hold of.